Jerry Seinfeld is a renowned American stand-up comedian, screenwriter, actor, producer and director who is one of the brains behind the sitcom Television Drama series for BBC titled Seinfeld, where he played a semi fictional version of himself, Seinfeld. The talented entertainer created many other programs while also holding down his forte as a stand up comedian and has made name for himself as one of the most successful stand-up comedians the world has ever seen. Jerry was born Jerome Allen Seinfeld on April 29, 1954 in Brooklyn, New York City ans was was raised in Massapequa, New York where he attended Massapequa High School in Long Island. His interest in comedy happened in his High school days but he further developed at the age of 16 when he volunteered at Kibbutz Sa’ar in Israel. He later proceeded to State University of New York at Oswego where he spent just two years before he transferred to Queens College, City University of New York where he majored and earned a degree in Communications and theater. During his college, he made an appearance on open mic nights at Budd Friedman’s Improve Club and performed to the admiration of his audience. Upon his graduation in 1976, he featured again in the open mic night at Catch a Rising Star of New York which propelled him to feature in a Rodney Dangerfield HBO special. As his fame grew, he got himself a minor recurring role on the sitcom Benson where he played as Frankie. Jerry Seinfeld went on to feature in Tonight’s Show Starring Johnny Carson in 1981; the success of the appearance landed him other scripts including Late Night with David Letterman. With the wealth of experience and fortune Jerry had garnered in showbiz, he created the Seinfeld Chronicles together with Larry David in 1988, the show was later rechristened Seinfeld to stand it out and avoid name duplication and confusion with then teen sitcom The Marshall Chronicles. The show lasted for two decades after the final episode was aired in 1998 but not without becoming the most watched and successful sitcom on American Television. In the late ’90s, Jerry Seinfeld made a return to his stand up comedy and embarked on countless national tours of comedy clubs and theaters. He would then record a comedy special named I’m Telling You for the Last Time. In the course of his tour and shows, a documentary titled Comedian was released in 2002 where Jerry;s activities were chronicled. As an author, Jerry has many beautiful books to his credit which are mostly achieves of past routines including Seinlanguage and Halloween. Aside his shows and books, he has also featured in over six films including Bee Movie (2007) which he voiced and co-wrote and produced. He has about 25 Television shows to his credit with several awards nominations which he won a good number of. With a career in showbiz and media that has spanned for more than forty years, the 5 ft 11 inches tall entertainer, has made fortune from his highly celebrated career in comedy. Comedy Central ranked him 12th in the list of the All Time Greatest Stand-up comedians. According to Forbes, his cumulative earnings from Seinfeld as of 2004 were $267 million. He pocketed $10 million just for his appearance with Bill Gates in Microsoft’s 2008 advertisement for windows. 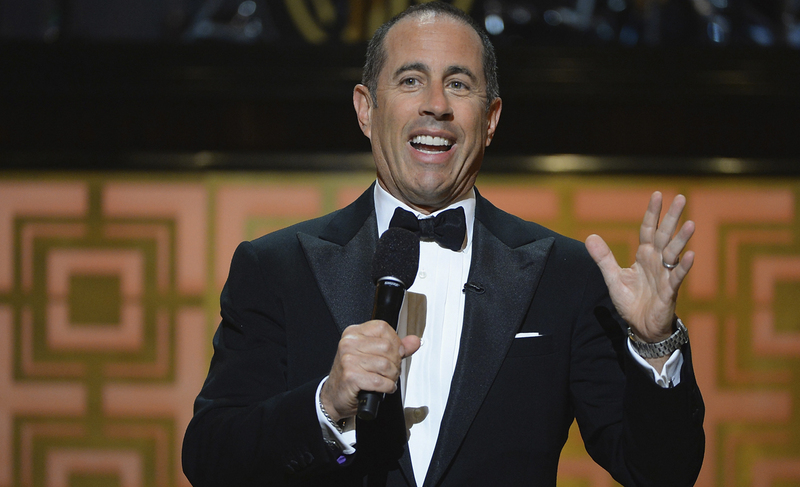 Forbes records also showed that Jerry Seinfeld featured 3 years back to back on the list of highest paid comedians for 2015, 2016 and 2017. These earnings and many more brought Jerry’s Net Worth to $950 million. Jerry’s love for exotic cars is quite undeniable; the American entertainer is said to own about 150 cars which are mostly Porsches. That’s incredible Huh? Jerry Seinfeld was born to Hungarian Jewish father, Kalman Seinfeld and Syrian Jewish mother, Betty Seinfeld. His father collected Jokes that he cracked during the World War II, he was born in 1918 and died in 1985 whereas the Mum lived from 1915 through 2014 when she died. Jerry identifies as Hungarian, Syrian and Jewish by ethnicity. In the course of Jerry Seinfeld’s career, he came across some beautiful ladies whom he dated in the past like Comedienne Carol Leifer, and Shoshanna Lonstein before finally settling with Jessica Sklar whom she met in August of 1988 at Reebok Sports Club. Jessica is an American author and passionate philanthropist, born Nina Danielle Sklar on September 2, 1971 in Oyster Bay, New York to City Social worker mother and a software engineer father. She attended University of Vermont before working at Golden Books Entertainment and Tommy Hilfiger as a Public Relations Officer. When their path crossed in 1998, she was newly married to Broadway show producer, Eric Nederlander and had just returned from her three weeks honeymoon trip from Italy. Things seemed to change upon sighting Jerry; she filed a divorce against Eric immediately. Jerry Seinfeld proposed to her on November 6, 1999 in SoHo boite Balthazer in New York, and on Christmas Day (December 25, 1999) they wedded with George Wallace (an American actor and comedian) as the best man. They went on to acquire a house worth $32 million dollars from Billy Joel. The union has birthed three children; a daughter and two sons. The first child (daughter) named Sascha Seinfeld was born on November 7, 2000, followed by the first son named Julian Kal Seinfeld who was born on March 1, 2003 and the second son, Shepherd Kellen Seinfeld was born on August 22, 2005. The lovely family has been having a wonderful life and has always shared the videos and pictures online to the admiration of their fans.